Place dough in a large pot, I place pot in warm water for around 1 hour till dough has doubled in size. Halve dough, place one in fridge/freezer for use another day. Follow instructions in recipe link above for rolling out, filling and second prove. Still using the thermomix on average 4-5 times a day, slushies every day, ( instead of iceblocks) chopping onion, garlic and ginger, steaming veg, mashing potatoes, making salads and coleslaws, making dips, dressings, breads, pizza, focaccia, or pita. Like having a helping pair of hands in kitchen. Has added so much variety to our food. Haven’t added photos of food cooked on previously. 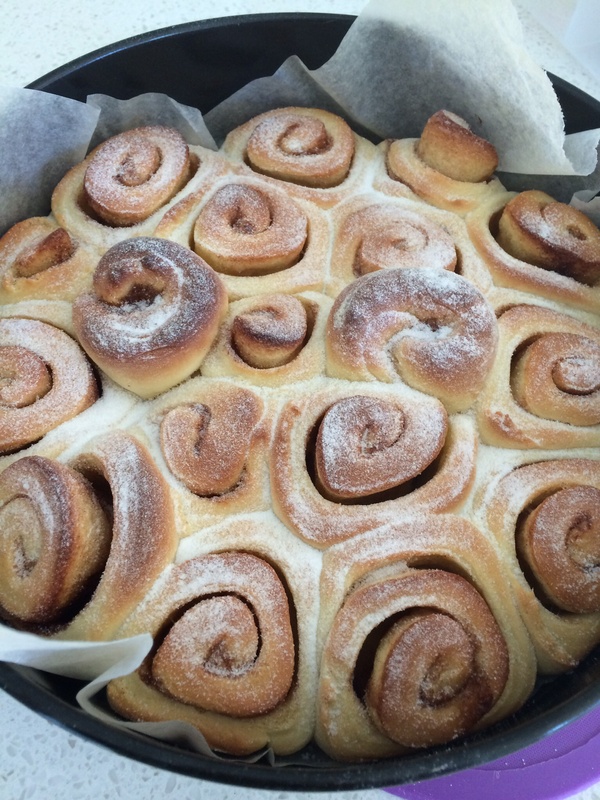 But couldn’t resist posting the cinnamon buns because they’re so good and only three minutes kneading with the thermomix. Recipe from the Annabelle Langbeins free range cookbook. Even though me and husband are trying to reduce gluten we succumb to a cinnamon bun because the smell of these baking is so appetising! And the recipe makes enough dough for two baking tins, one is always saved in fridge for ham and cheese or vegemite and cheese scrolls the following day.